› Author AffiliationsR.R. thanks the University Grants Commission, India for a fellowship under Dr. D. S. Kothari Postdoctoral Scheme (No. CH/14-15/0132). SCN thanks Indian National Science Academy, New Delhi for the award of INSA Distinguished Professorship. 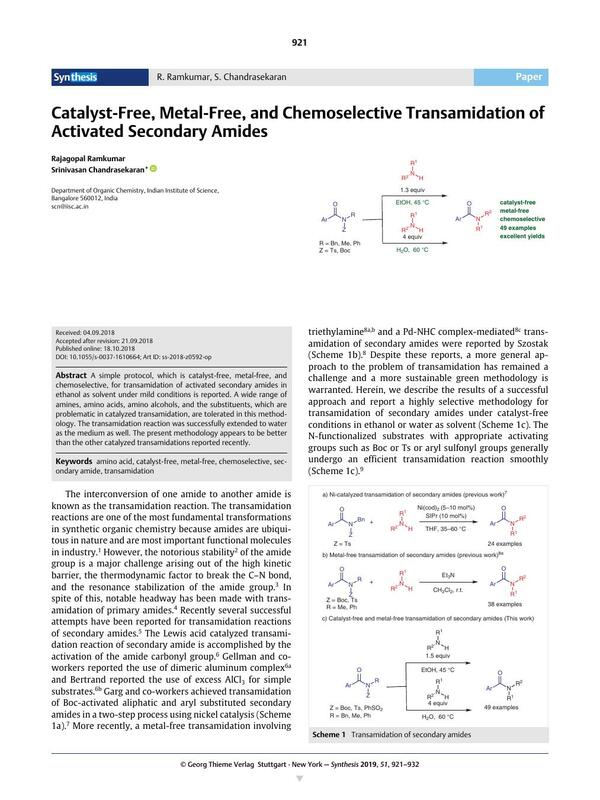 A simple protocol, which is catalyst-free, metal-free, and chemoselective, for transamidation of activated secondary amides in ethanol as solvent under mild conditions is reported. A wide range of amines, amino acids, amino alcohols, and the substituents, which are problematic in catalyzed transamidation, are tolerated in this methodology. The transamidation reaction was successfully extended to water as the medium as well. The present methodology appears to be better than the other catalyzed transamidations reported recently. Supporting information (copies of 1H and 13NMR spectra of all compounds) for this article is available online at https://doi.org/10.1055/s-0037-1610664.